This guided safari gives you a close encounter with wildlife and an opportunity to marvel the beauty of nature. Etosha National Park is rated as one of the best national parks in Southern Africa. Enjoy your game drives in search of the Big 4 and other species of wild animals, appreciate the natural waterholes, and enjoy your stay in comfortable resorts offering delicious meals. You will be staying at Discovery Guesthouse, Windhoek, on your first day and while visiting Etosha National Park you will be residing at Okaukuejo Resort. You can choose to stay in a private room or in a shared double room. As soon as you land, representatives of Discovery Transfer and Tours CC will pick you up from the Hosea Kutako International Airport (WDH). The airport is 45-kilometers outside Windhoek, the capital city of Namibia. Overnight stay and dinner will be at Discovery Guest House. You will be served dinner on this day. You will depart at 09:00 towards the north of the country to reach Etosha National Park. You will have a lovely lunch break in Otjiwarongo or Outjo. You will drive through the national park in search of wildlife and may chance to see elephants, rhino, zebras, various game (oryx, kudu, wildebeest, impala, springbok, and gemsbok) giraffes, hyenas, and big cats of Africa that include lions, leopards, and cheetahs inhabiting the enormous grasslands. You will be at your resort just before sunset. Dinner will sum-up the adventure and rest will be required so that you can work up early and fresh for the next adventure. Overnight stay and dinner will be at Okaukuejo Resort. You will be served breakfast, lunch, and dinner on this day. Today, an early rise will be encouraged to have the feel of nature and the fresh breeze. Soon after breakfast, you will start your game drive to proceed towards a magnificent day of exploration. 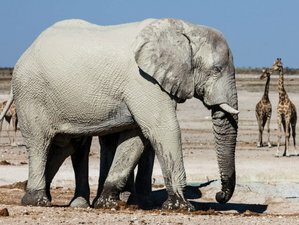 You will visit the waterholes and will get to tour the Etosha pan (salt pan) before enjoying your game drive across the park in an expedition of coming across the Big 4 and other animal species. A light lunch will allow you to rest and gather energy for your next adventure. You will then visit the last waterhole, a final appreciation spot of Namibia’s beauty. Before sunset, you will be back to your resort where you will have dinner, exchange stories of your experiences of the day, and also share and compare beautiful photos. Overnight stay and dinner will be at Okaukuejo Resort. You will be served breakfast, lunch, and dinner on this day. Be prepared for a long and scenic transit back to Windhoek, on this day. You will pass through towns and rural areas, stopping in the small town of Okahandja, the home of Namibia’s largest wood carving market. The stalls operate on a local co-operative basis and offer a vast array of truly Namibian souvenirs. You will be back in Windhoek by late afternoon or early evening and will be dropped off at Discovery Guest House. You will be served breakfast and lunch on this day. You will be enjoying game drives, touring the Etosha pan, and visiting various waterholes in Etosha National Park. This safari will take you across the Etosha National Park, Namibia. During this safari you will be offered daily breakfast, lunch, and dinner. On the first day of the safari you will be served dinner only and on the last day, only breakfast and lunch is included. Please book your flight to arrive at Hosea Kutako International Airport (WDH). Transfer from the airport is included. Discovery Transfer and Tours CC will pick you up from the airport. Discovery Transfer and Tours CC offers lodging safaris as well as camping safaris across Namibia, Botswana, and Victoria Falls.